Many people, unfortunately including some carpet cleaners, think that rugs and carpets are the same and can be cleaned the same. The reality is that a rugs construction makes it a very different beast to deal with. Also the way rugs are used means that they often come in for heavy use and when they are correctly cleaned an amazing amount of dry soiling can be removed from even small rugs. The significance of this is that for all by the very cheapest of rugs cleaning using carpet cleaning methods will not properly clean your rug. Correct deep cleaning will mean that your rugs will become significantly wetter than would a carpet and this then needs professional drying in order to ensure that the rug dries correctly. 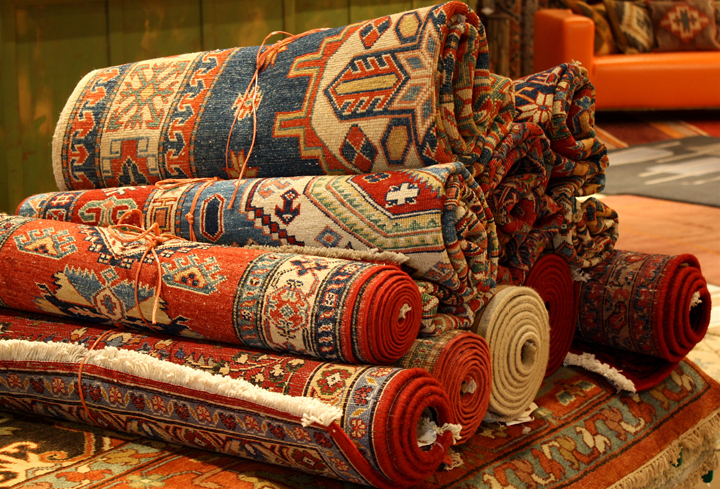 In order to ensure the finest cleaning of your rugs I offer a free collection and delivery service. I have set up a purpose built rug unit to deal with the large number of rugs I deal with. This allows me sufficient space to firstly back dust the rugs to beat out as much dry soil as possible. The rug is then turned over and air dusted using a high power compressed air blower to remove the rest of the soiling. An appropriate cleaning for the type of rug is then used and agitated to ensure all the fibres are covered. After an appropriate dwell time the cleaning solution is thoroughly rinsed out. The rug is now ready for drying. Here it can either be hung over drying racks of dried flat on a special drying platform that allows the air to circulate both to the face fibre and the backing of the rug . Once thoroughly dry the rugs are wrapped ready for delivery back to you. If you care for your rugs and want the best Oakham rug cleaning contact me now.